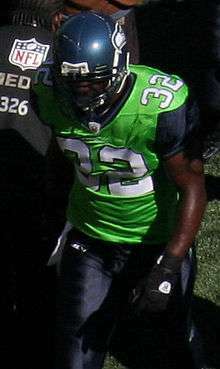 James with the Seahawks in 2009. Edgerrin Tyree James (/ˈɛdʒərɪn ˈdʒeɪmz/; born August 1, 1978) is a former American football running back who played in the National Football League (NFL) for eleven seasons. He played college football for the University of Miami. He was drafted by the Indianapolis Colts fourth overall in the 1999 NFL Draft. James also played for the Arizona Cardinals and Seattle Seahawks. The AP NFL Offensive Rookie of the Year in 1999, he earned four Pro Bowl selections and four All-Pro selections. James ranks third in all-time University of Miami rushing yards. He was the only running back in the university's history to post two consecutive seasons with 1,000-plus rushing yards, and he ranks first in school history with the most 100-plus rushing games (14). All single season records held by James have since been broken by former Baltimore Ravens running back Willis McGahee. The Indianapolis Colts selected James in the first round of the 1999 NFL Draft with the fourth overall pick. James signed a seven-year, $49 million rookie contract. Some critics believed that the Colts made a mistake by choosing James over the reigning Heisman Trophy winner Ricky Williams, but he proved to be the right choice for the Colts offense. James quieted the critics and was an immediate success, and was named the 1999 NFL Offensive Rookie of the Year by the Associated Press. James won the NFL rushing title in his first two seasons. He's the most recent player to win the NFL rushing title in his rookie season. Six games into the 2001 season, he tore his ACL. James had over 1,500 rushing yards in both 2004 and 2005. James signed a four-year, $30 million deal with the Arizona Cardinals on March 23, 2006. James went through a stretch of 10 games out of the 2008 season where he carried the ball only 20 times. Through this time, Ken Whisenhunt brought him in strictly as a pass protector. In Week 17 against the Seattle Seahawks, James carried the ball 14 times for 100 yards. James said he would not come back to Arizona following the 2009 NFL playoffs, despite a year left on his contract. In the Cardinals' first playoff game since 1998, James averaged 4.7 yards per carry and ran for 100 yards. In the Divisional round of the playoffs, James rushed for 57 yards and a touchdown in the Cardinals' upset victory over the heavily favored Carolina Panthers. James rushed for 73 yards in the Cardinals' 32-25 win over the Philadelphia Eagles in the NFC Championship game. James rushed 9 times for 33 yards in the Cardinals' 27-23 loss to the Pittsburgh Steelers in Super Bowl XLIII. On July 26, 2011, James announced his retirement from football. James currently resides in Miami, Florida. He has six children: Edquisha, Emani, Eyahna, Edgerrin Jr., Euro and Eden. On April 14, 2009, Andia Wilson, James' long-time girlfriend and the mother of his four children, died from leukemia at the age of 30. ↑ "1999 NFL draft re-visited". Fox Sports. 2007-04-24. Retrieved 2007-10-02. 1 2 3 Dorsey, David (January 6, 2010). "Edgerrin James eyes return to playing". The News-Press. Retrieved 2010-02-03. ↑ "Edgerrin James lands in Seattle | ProFootballTalk". Profootballtalk.nbcsports.com. Retrieved 2011-09-20. ↑ "Seahawks dump Duckett | ProFootballTalk". Profootballtalk.nbcsports.com. Retrieved 2011-09-20. ↑ ":: Edgerrin James announces retirement from NFL | Edgerrin James". Procanes.com. Retrieved 2011-09-20. ↑ "Edgerrin James' girlfriend, mother of his 4 kids, dies of leukemia". Naples Daily News. April 19, 2009. Archived from the original on 2013-03-22.